In the warmer regions of the world’s oceans, large seabirds called boobies plunge headfirst into the water, snatching up fish. But as a booby flies up from the waves with a fish now in its gullet, there may be another big seabird — a frigatebird — with its eye on the booby’s fresh catch. Now begins one of nature’s great chase scenes. Fortunately for boobies, frigatebirds don’t steal all their meals. Most of the time, they hunt their own seafood — perhaps a squid snapped from the ocean surface or a flying fish as it skims across the waves. This story was produced with support from the Bobolink Foundation. Some birds are masters at catching fish. In the warmer regions of the world’s oceans, large seabirds called boobies plunge headfirst into the water, snatching fish in their dagger-shaped bills. But as a booby flies up from the waves with a fish now in its gullet, there may be another big seabird, a frigatebird, waiting overhead. With its eye on the booby — and on the booby’s fresh catch. Now begins one of nature’s great chase scenes. The booby flaps full throttle away from the frigatebird. But there’s no escaping. With a light body suspended on long, narrow wings and a long, scissor-like tail to match, the frigatebird is faster and more agile. It lopes up behind the frantic booby and, with its long, slender, hooked bill, clamps onto the booby’s tail or wing-tip. Thus snagged in mid-air, the booby flails. A crash is imminent, unless it surrenders what the frigatebird wants. So it disgorges the fish it’s just captured. 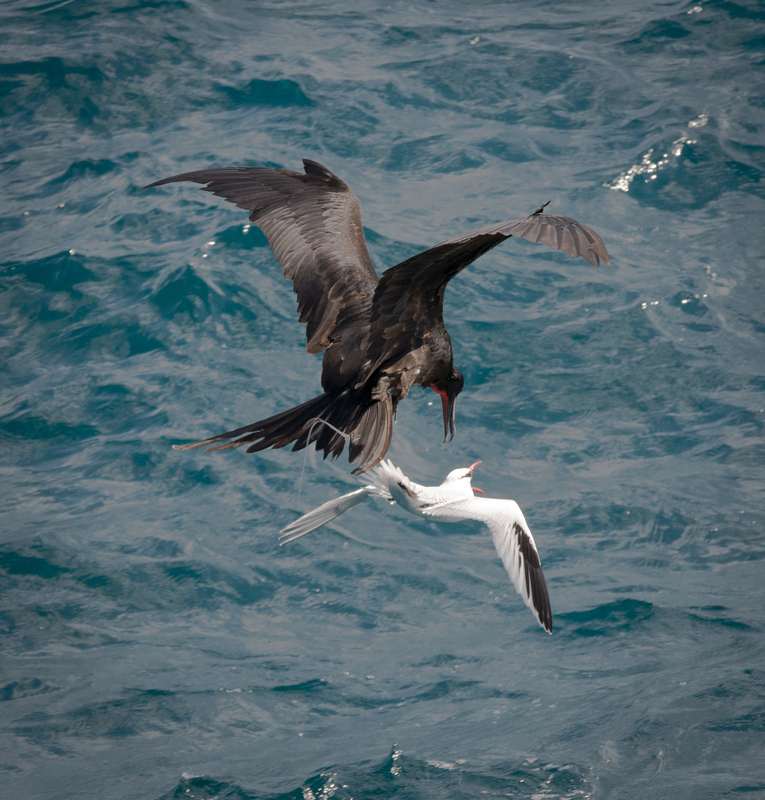 The frigatebird releases the booby and swiftly snatches the free-falling fish. Fortunately for boobies, frigatebirds don’t steal all their meals. Most of the time, they hunt their own seafood — perhaps a squid snapped from the ocean surface or a flying fish as it skims across the waves. But now and again, when a chance comes up, they’ll take it. 6036 recorded by Robert J. Shallenberger and 136232 recorded by Martha J. Fischer.